"Uhhhmmm... how cold did you say the water is?" A little bit of a tardy race report. 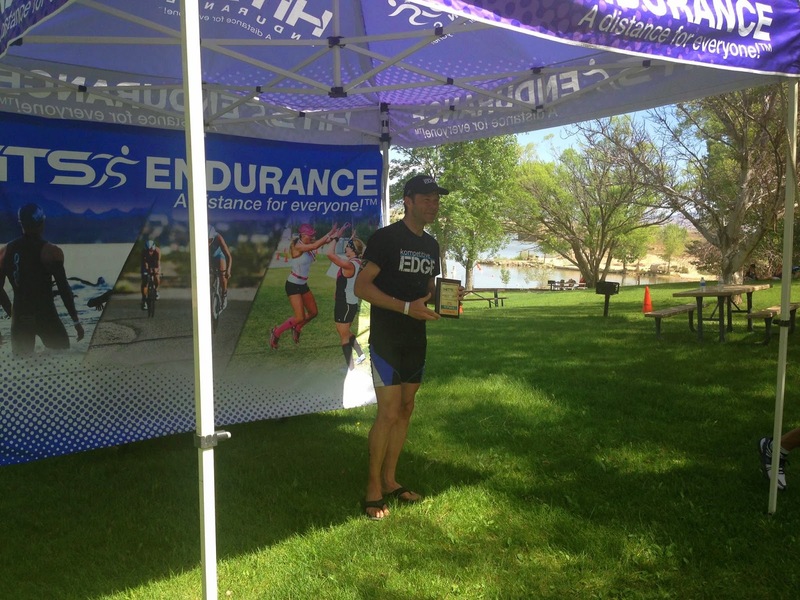 Two weekends back I raced my first race of the season: The HITS Series in Grand Junction, CO. There were a variety of events / distances that you could compete in. I raced the Olympic distance (for those that don't speak 'tri' that read this, that's a 1500m swim / 40km bike / 10km run. I'll spill the results early in case you want to stop reading here ;-) Overall I had a good solid race. I took first in my division and 15th overall (all ages / divisions) although it was a tough race I had to reel back in during the bike and especially on the run (more on that below). If you haven't been keeping track. We've had a bit of a slow start to our summer weather here in Colorado. Just a couple weeks before the race, we had about 8 inches of snow dumped on us down here in the city. Driving up to the race venue, we passed through a bit of snow falling in the mountains. Although we knew that the weather had been a bit warmer on the western slope (where the race was held), it's still a little unnerving to be driving through snow falling on your way to a race! We arrived Friday night and got to dip our toes in the lake while picking up registration packets. Brrrr... yeah - it is, what it is. Just deal with it. Paige was racing the Aquabike (1.2 mi swim / 56 mi bike) on Saturday and I was racing on Sunday - so at least I'd get a report on how the water felt during the swim (we both have about the same tolerance of being cold). 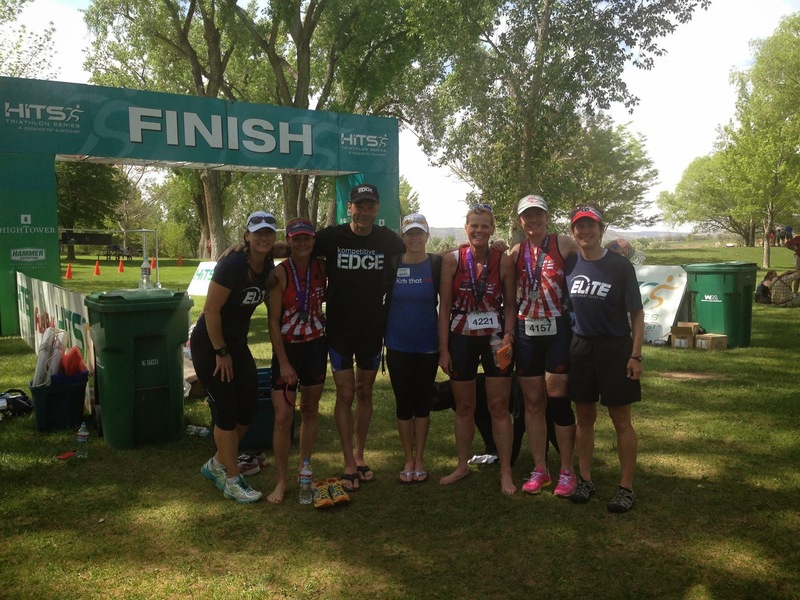 There were also a number of teammates from the Kompetitive Edge Team and Elite MultiSport racing as well as the Teens that Tri team (which Paige coaches), so it made for a fun weekend to cheer and be cheered. 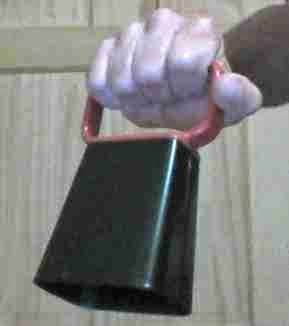 We brought our extra large race cowbell - just right for the occasion! 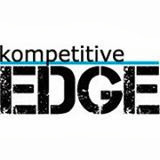 The Saturday races went off well with the KE and EMC team-mates all putting up some strong podiums. Paige took 2nd overall in the women's aquabike (bested only by her coach (and former 2004 Olympic Bronze medalist in Triathlon; Susan Williams). While everyone looked happy to be coming out of the water, nobody looked happy from having been 'in' the water. There were some blue faces and a lot of stumbling to get the wet-suits off - especially by our brave team-mate, Sharon - who did the full distance (2.4mi) swim. I stuck around while Paige was out on her bike to cheer in the last few folks that were really struggling with the full distance swim. There was a lot of wobbly knees trying to stand up and get re-oriented to a vertical and much warmer world. The race organizers did a great job with safety though and everyone made it out of the water safe and sound - just a bit worse for wear. Got up and went through my usual routine. I've had my feet solidly planted in an ME (low'er' carb) diet in the past weeks (more on that in a future post), and have been having good results from that. So I stuck to my usual 1:1 (CHO to Protein), higher fat breakfast. Then did 1 1/2 scoops of UCAN about 30 mins before hitting the water. From there on out it was just 1 1/2 scoops of UCAN on the bike and a few sips of water off the course on the run. Felt fully energized for the whole 2 hours of racing. Good test of the nutrition. 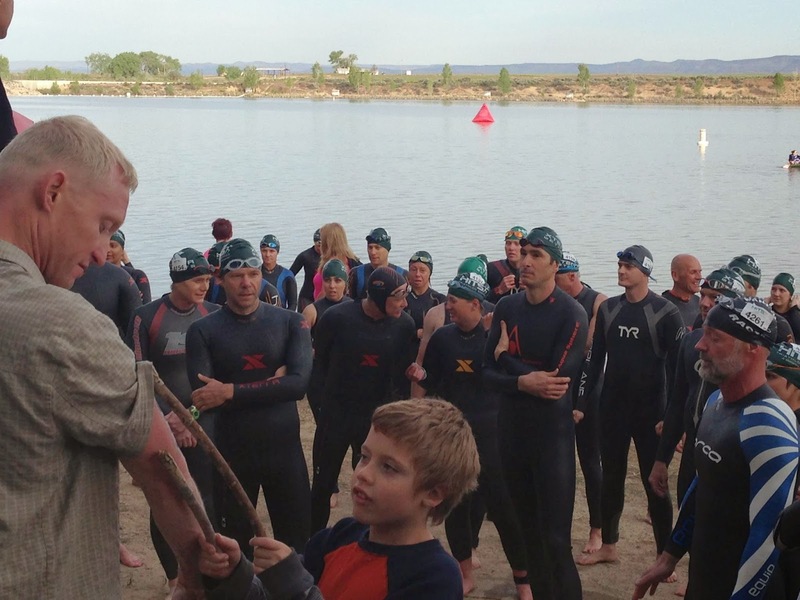 While setting up transition, we were hearing the water was 62 degrees. I have since come to believe that was a white lie, to keep anyone from freaking out. Past experiences and some recent swims in Chatfield at 60 degrees substantiates that the water at HITS was probably more like 55 degrees. It was a wave start and even with the bit of warm up I did, the first 500m just totally sucked. Judging by the number of bobbing heads 100m out, I wasn't the only one struggling to catch a decent breath. This also kept the pack from spreading out and so there was a lot of body contact for the first 750m or so and it was really tough to find 'clear' water (a clean line). I'll say this. It was more annoying than anything because I'd get going and someone would sink my legs, which caused you to come to a complete stop, having to regroup. My hands and feet were completely numb. All I could feel was my index fingers. I just trusted that they were out there somewhere and focused on pulling with my forearms. After 500m, I started to feel better and got into a decent rhythm. I was able to start finding clean water, although I never could find anyone swimming straight enough to draft off of so I was on my own. It's a two lap course, so you get out of the water on the beach, run around a cone and then dive back in for a second lap. By the time I started that second lap I was feeling great and almost wished I could have had yet another lap to redeem my swim time. Ah well, good experience learned (do a better warm up when the water is that cold). T1 went without a hitch. I actually was happy to be vertical and running up the long stretch to transition. I delayed getting my wet suit off until I hit the transition rack, just to have a bit more functional hands as they warmed up. Got on the bike and instantly felt 'home' as I always do when I settle in for the ride. The course is relatively flat, although there are a few hills here and there. Also a bit of a headwind on the way back. I rode a solid bike, but more like tempo effort than blowing it out. Just wanted to make sure the run part would come together for this first race. In retrospect and based on past power numbers / threshold tests, I could have rode the bike 4-5 minutes faster and would have only given up about a minute (max) on the run. But again - solid bike with a split (17th) that lined up pretty well with my overall place. Coming out of T2 I started to really get to work. Normally at this point in the race I'm generally pretty good about my position overall and just have to focus on keeping the pressure on and making up a bit of time. In this case, I assumed that the podium was in all front of me and I needed to work hard to run people down. Run course was warm (edging up to hot) and hilly with no shade. While I don't necessarily 'like' running in those conditions, I'm generally better than most at running in those conditions, especially hills. So being it's a race, I welcomed it and it jazzed me up to hear in the pre-race meeting that the course was hilly. Bit by bit I chased people down. No age group leg markings, so I just assumed anybody in front of me was in my division and went to work reeling them in if I could. The guy called out, "Tell me you're not in your 50's" - to which I replied without turning around, "Sorry dude - I wish I could, I wish I could" - and thought, "Ok, there is a 50% chance then he's in my specific age group" - and I ran harder as I headed up the last climb. By the time I turned the final corner, I snuck a peripheral glance over the last 200m of the course I had just crossed (earthen dam), and it was empty. Cool, he didn't or couldn't chase. Free-wheeled the legs to the finish with one final kick and the first race of the season was on the books with an overall 9th place run split. When I need it, the run always seems to come through for me. I felt good at the finish, although man, the chip-nazi's were all over you to get that timing chip back. I barely breathed out, "Just give me a second" and when she replied, "It's ok, I can do this really quickly" - I laughed and said, "You don't understand. I just don't want to throw up on your head". She laughed and stood back - 'Fair enough'. Five seconds or so and I had my dry heaves under control. Again - really great to have such a big crew out there on race day. Really terrific venue - good sized race, but easy to find everyone and get around. Also a beautiful location and course and the organization was top drawer. Highly recommend it!! After awards we went back to the hotel and packed up the car. It's not ideal to drive 3+ hours back right after a race, but it ended up being ok. Luke dozed in the car and Paige and I got to chat about the race and spend some alone time together - which is always nice. I've also adjusted some training and racing strategies based on the race feedback. One thing was getting out there a couple times in the cold open water and experimenting with some strategies to keep that shock fest from making me have to chase down the podium so hard on the run next time.